PATTY: Hey, hey my Legacy leader. How are you? This is Patty here. We’re talking about ” Does it make sense to look at your competition?”HLP009 Why checking out your competition is a good idea But first I wanted to give a big shout out for some reviews I got over on iTunes. I super appreciate it. As I mentioned I will give you a shout out the first one is from Sally Kennedy where she says I love this podcast they’re short and to the point. Patty knows how to condense information into simple action steps. Patty’s podcast hits the spot. I’m so thankful for this. Well thank you, Dr. Christine, I super appreciate you and thank you all three of you for leaving your reviews. I do not take it lightly and I am very very inspired by just the love, the love I’m feeling. I mean that’s what it is. So thank you so much for leaving those phenomenal reviews I appreciate you all very greatly. So now onto the show where we’re talking about should we be looking at our competition? And my answer is yes and here’s why? Now it may be a situation where like I don’t need to pay attention to my competition I don’t need to see what they’re doing. But let me explain why. The reason is that things move so fast in this day and age and things that may have worked before. How do you know that they’re working the same is the message that you’re sharing resonating with your ideal customer? So here’s where having something unique about you is only verifiable that it’s unique if you have a pulse on what’s happening with the competition. And by that I mean just really recognizing who is in your competitive landscape what are they talking about. How are they showing up? How are they making their claims and staking their flag in the ground and talking about what solution they provide specifically to that perfect customer which may be your perfect customer right? So the deal is I’m a part of like a mastermind group and we were having this conversation around how do you stand out uniquely and ensure we’re talking about competitive landscape talking about the competition and really getting a gauge if this is something that most people do. And what I have found is that most people do not and they say well it’s just I don’t really pay attention to the competition. And here’s the thing it’s a disservice to not really have a handle on who is in your competitive set. Now you may be in a super crowded market where there’s a lot going on. You don’t have to look at everybody but you do have to look at who are the key players in that field like people that you want to model. There was another comment that came through around why don’t want to copy and you don’t want to copy you don’t want to be a copycat or me too because quite frankly the only position you’re ever going to achieve there is second because you can’t be that one. So the purpose of this though is to really take a look outside of your immediate Four Walls who is doing what you’re doing. What claims are they making? How are they proving their worth and what is unique about what it is that they do? What’s the system or the secret sauce if you will and make note of that. Because just because your secret sauce your magical widget worked once upon a time it doesn’t mean it’s going to work this year or next year. You have to keep a pulse on what’s going on with your competition so that you’re on it right so that you are going with the times and not falling short and not being just irrelevant eventually you don’t want to be irrelevant right. So take note of what the competition is doing and I’ll share some information when I mean by that. The second or the third thing to look at is from a differentiation standpoint how are they standing out. Are they different? Is it distinct? Are they unique enough in what it is that they do? And how do you know that? So proving their process or their secret sauce is it very clear to you that they are able to articulate it. And do they stand out? And of course is it clear who their target audience says. What kind of social proof do they have? I know we’ve all heard about the power of social proof really taking a look at those credentials that are very important. This came up as well. And the conversation we were having is most people talk about their credentials and I happen to think that credentials are great but they really are a cost of entry not necessarily a competitive advantage. So you’ll be on those sites where people are braggy braggy braggy talking about themselves where that is not seeing things from the right perspective you have to make it about your ideal customer. What are they doing? And if you are on that website right of somebody else like you the first thing they’ll probably come to mind is like why I care about this. I want a solution to my problem as an ideal prospect. So give me the answer shows me the way and my interested enough to take a look at what you have to say? So always look at things from the lens of your consumer first of your clients first of your customer first. Okay. And then with that intro, you can really start to play around with headlines and conversations and hook six etcetera and really modify what it is that you’re doing to meet that valley ethos of what your ideal customer is looking for. I want to say is like how do you harmonize right. How do you harmonize everything that you’re talking about so that your ideal customer is compelled to take action whether it’s opting in for some pain whether it’s scheduling a phone call filling out an application any of these proof points where they’re exchanging their information to want to have that next conversation with you. So should you look at your competitive set the competitive landscape competitors in your space? I say absolutely. How often. Just keeping a pulse on this and what I thought was really great is that I actually had somebody help me with this whole process. You can hire someone you can hire a virtual assistant you don’t necessarily have to do all the groundwork to this. It has a very powerful process to go through though because it really gives you a nice perspective on what you should be considering what you should be looking at. And even if you have been standing out uniquely in your own always keep a pause because you can never get too complacent, because somebody is going to come in and expand on that idea that you had once upon a time. And it’s just going to be more of the same it’ll create more of the same that’s which you don’t want. All right well thank you so much for joining me on this her legacy podcast show. I thought I would share this whole thing about the competition because I find that there’s a trend that most people don’t look for it. So I hope this incited some action and you know to make sure to check out our shows for this episode number eight. You just go to her legacy podcast.com show 8 and then you can grab a download which includes a matrix sample of the key information that you want to be tracking. All right cool. So thank you so much for joining. We’ll see you at the next one. 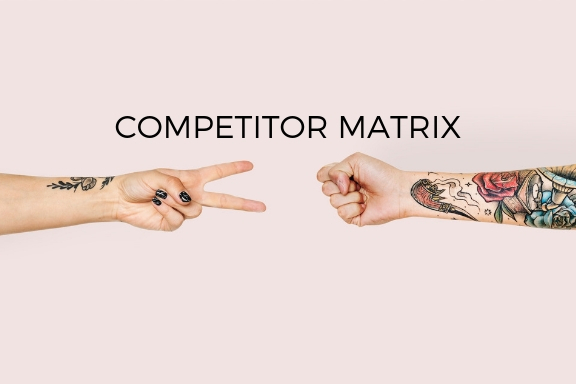 Get Your Complimentary "Competitor Matrix"
Yay! You will be receiving your complimentary Competitor Matrix - check your email inbox.